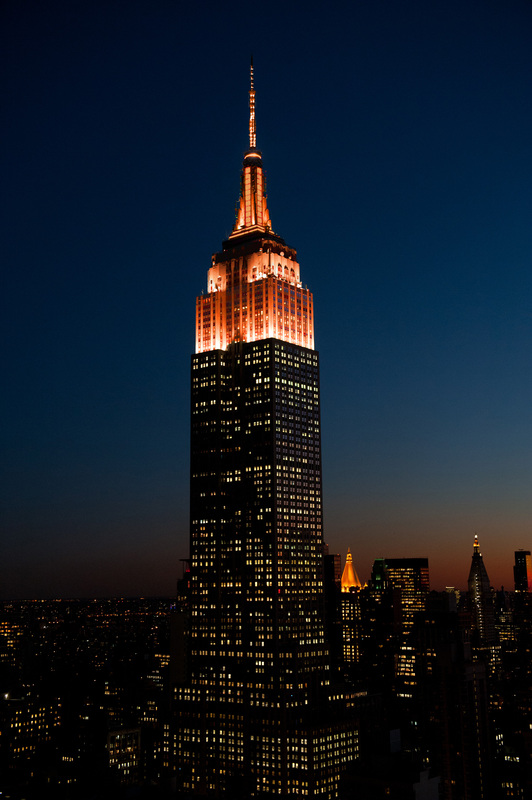 New York, NY -- The Empire State Building will remind the world on March 10, 2016, that there's a growing public health crisis in our midst by shining in orange, the official color of the National Kidney Foundation (NKF), in celebration of World Kidney Day. "The Empire State Building is the lighthouse of the world, and on World Kidney Day, it will be NKF's lighthouse, reminding people about the urgent need to get their kidney function tested," said Kevin Longino, CEO of the National Kidney Foundation. "A third of us are at risk for kidney disease and 26 million have this condition but most don't know it. Early detection is so vital to preventing or slowing the catastrophic effects of this condition. We hope that this 'landmark celebration' will help motivate people to act as well as inform others." Recognized on the second Thursday in March, World Kidney Day raises awareness of the importance of kidneys to health and the urgent need to address the worldwide epidemic of kidney disease and its associated health problems. Because of increasing rates of diabetes and high blood pressure, kidney disease has reached critical levels, affecting millions of people and their families, and is costing billions in healthcare expenditures. Most people are unaware of how important kidneys are to overall health. Kidneys embody the term "vital organs." Your body simply cannot function without them. Yet they are often overlooked in comparison to other health priorities. The kidneys perform many vital functions that include regulating chemicals and hormones in the body, helping to produce red blood cells, controlling blood pressure, and filtering out muscle waste and excess fluid from the blood. "Of the 26 million American adults estimated to have kidney disease, most don't know they have it. That's why taking care of your kidneys, especially if you are at risk for kidney disease, is vital," said Joseph Vassalotti, MD, National Kidney Foundation Chief Medical Officer. "Knowing the risk factors and controlling the major ones, such as diabetes and high blood pressure, may prevent kidney failure. Regular physical activity and a diet low in fat, sodium and sugar can help reduce risk." In the United States, more than 73 million adults are at risk for kidney disease due to high blood pressure, diabetes, a family history of kidney failure, or being over age 60. Certain populations such as African Americans, Hispanics, Asians, Pacific Islanders, and Native Americans need to be aware that they are at increased risk for this condition. The National Kidney Foundation urges people at risk to take a simple ACR urine test and a GFR blood test to assess kidney function. Learn how to reduce personal risk of developing kidney disease by visiting www.kidney.org. World Kidney Day has been held since 2006, with growing numbers of countries participating, now closing in on a hundred. It takes place during March, which is also National Kidney Month across the country, and the world. The National Kidney Foundation is the leading organization in the U.S. dedicated to the awareness, prevention, and treatment of kidney disease for patients and their families, healthcare professionals, and people at risk. For more information, visit www.kidney.org. Soaring 1,454 feet above Midtown Manhattan (from base to antenna), the Empire State Building, owned by Empire State Realty is the "World's Most Famous Office Building." With new investments in energy efficiency, infrastructure, public areas, and amenities, the Empire State Building has attracted first-rate tenants in a diverse array of industries from around the world. The skyscraper's robust broadcasting technology supports all major television and FM radio stations in the New York metropolitan market. The Empire State Building was named America's favorite building in a poll conducted by the American Institute of Architects, and the Empire State Building Observatory is one of the world's most beloved attractions as the region's #1 tourist destination. For more information on the Empire State Building, please visit www.empirestatebuilding.com,www.facebook.com/empirestatebuilding, @EmpireStateBldg, www.instagram.com/empirestatebldg,www.youtube.com/esbnyc or www.pinterest.com/empirestatebldg/.